Miskolc is the fourth largest city in Hungary. It is known for the fact that for almost 100 years it was a major center of heavy engineering and metallurgy. Today the city turned into a real tourist Mecca: thermal springs, karst caves, castles and chic hotels... and all these things are flavored with interesting legends. One day a merchant arrived to the city. After stopping for the night, he ordered a plate of a kholodets (aspic). 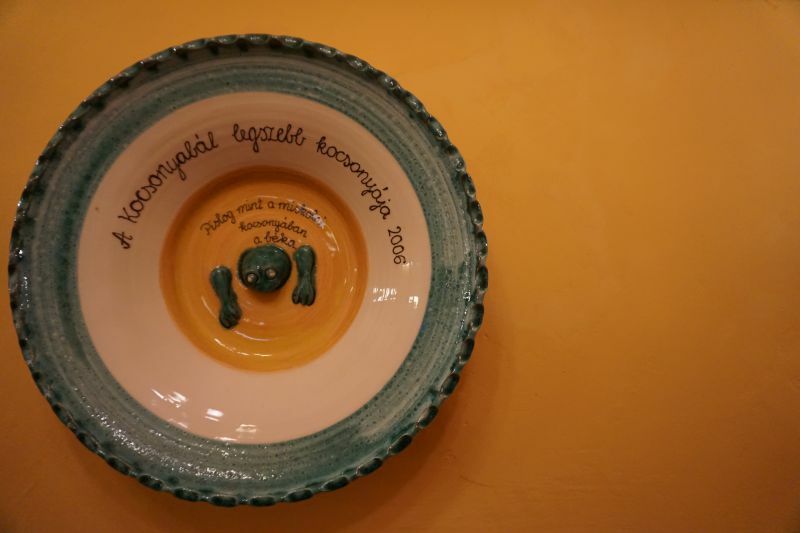 The owner of the boarding house, where the man lived, kept the stock of this dish in the cellar. A frog fell into the bowl that was served to the guest. This is how it froze. Seeing that the dish is literally looking at him, the merchant cried out: "This aspic has eyes!" Then many people learned about this story, and the frog became the symbol of the new festival. In the wine cellar of AranyKorona. Kocsonya Farsang in Miskolc is held every year, in February. Up to this time, the festival is considered to be one of the largest in Hungary. In the center of the city, on St. Stephen Square and on the main street, the most skilled "masters" of the aspic are gathering and at the end the best one is chosen. Of course, in the abundance of other dishes of local cuisine. Various singers, groups and bands perform on the established stage. 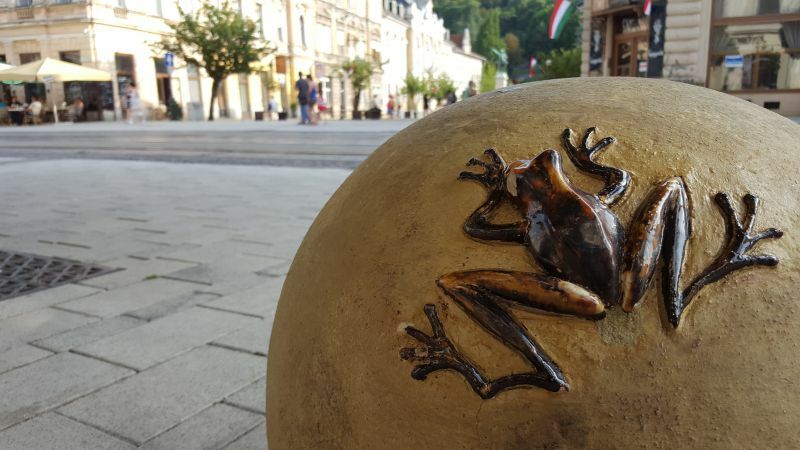 Inhabitants of Miskolc came to love the frog so much that it can be found almost everywhere. For example, as in this photo, in the heart of the city, near Erzsébet Square. The Hungarian word molnár means "miller". And they gave this name to the rock in Miskolc for a good reason. Legend has it that long time ago a wealthy landowner wanted to marry the daughter of a local miller. But the girl did not like the landowner at all: she was in love with the guy who worked at the mill. When the father ordered his daughter to marry the landowner, the lovers decided that if they cannot be together in this world, it is better to die. After climbing to the top of the cliff, they both fell into the abyss. After these sad events, the rock was named "Miller" (Molnár). Today there is a cross on top. 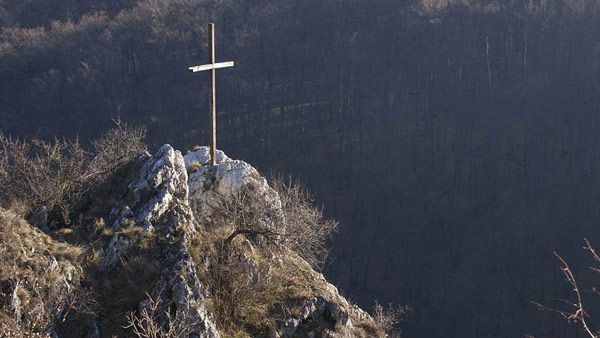 If you climb a rock, you will see an incredible view of Lillafüred, the most picturesque area of ​​Miskolc. 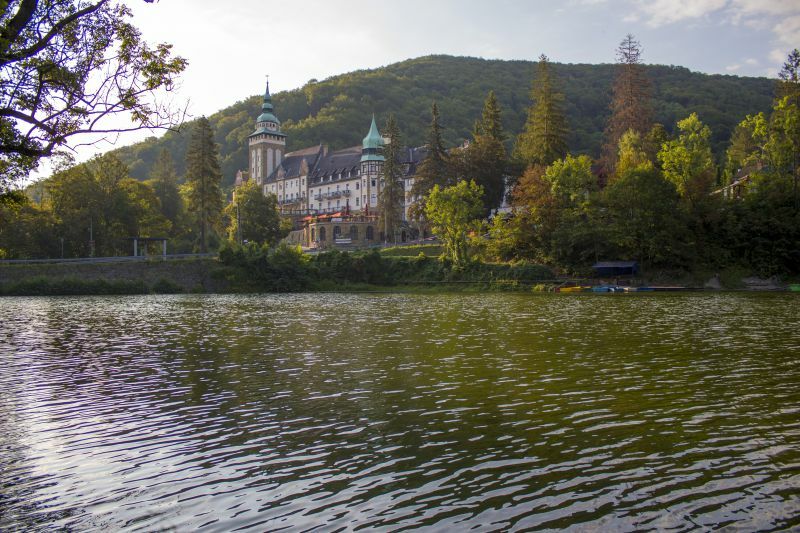 In a short drive away there is the luxurious castle-hotel "Palota" and the famous Hámori lake. By the way, we wrote the article about these and other gems of the city: "Sights of Miskolc: 9 places you should visit". 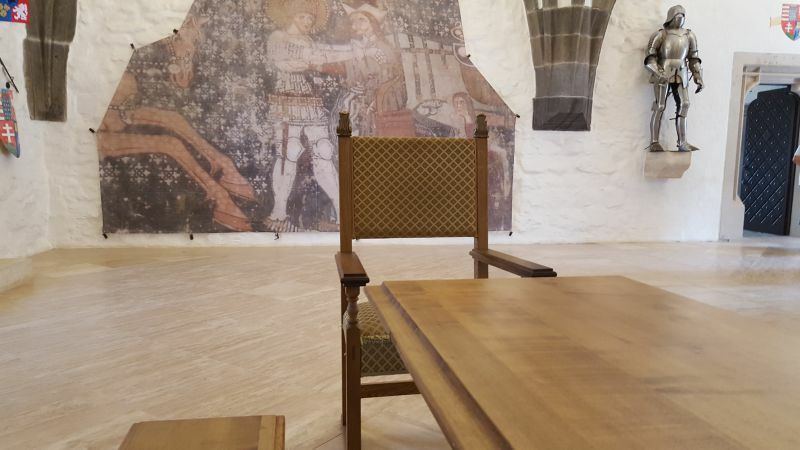 Another interesting legend is in some way connected with the fortress of Diosgyor in Miskolc. In the middle of the 14th century, Louis the Great, King of Hungary and Poland, completed the castle, added four towers to it and made it his favorite residence. After his death, the castle passed from hand to hand of six queens. Diosgyor became known as the castle of queens. It is curious that earlier the mother of Louis, Elizabeth of Poland, allegedly tried a mysterious mixture on herself, part of which was rosemary. According to legend, the elixir made Elizabeth young again and King Carl Robert of Hungary married her. Over time, the recipe was lost and no one knows how many queens used it. Today, Diosgyor Castle was rebuilt from the ruins in the literal sense of the word. It is as good as new! 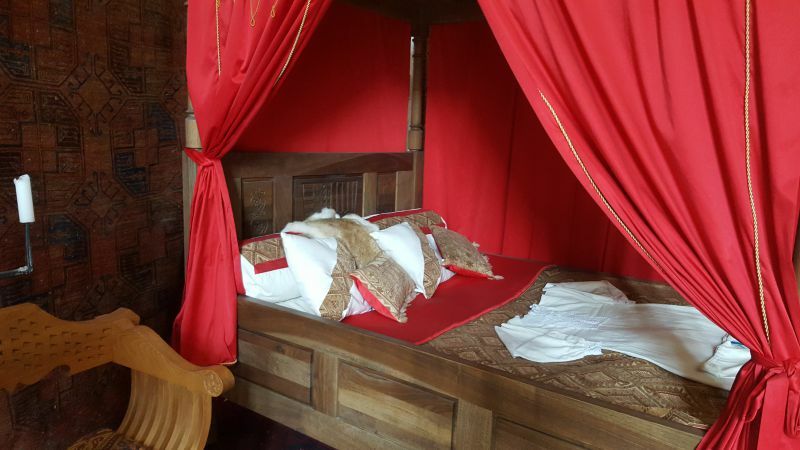 This place is definitely worth a visit... to learn many other legends, sit in the royal chair, at the royal table. Many pieces of furniture are made exactly as they were before and they can be used. Miskolc keeps many more secrets and legends. Come and discover the city yourself! The photos of the team of IGotoWorld are used in the article.